I’ve mentioned before–or at least hinted at–the fact that my husband, Ole, spends a bit of time in the kitchen. The truth is that he is just as integral to dinner preparations as I am most days. There has been one exception to this rule, however, and it comes into play when we wanted to eat bread with our meal. The man would not make bread. This wouldn’t be such a big deal, really, if it weren’t for his insistence that I make them. I don’t know what my issues were, but I would always run out of time for the rising that needed to happen, and so homemade bread was a rarity more than I would have liked, which is why I was pretty excited to discover Zoe’s Artisan Bread in Five Minutes a Day books a year ago, taking the day-off prep away and making it possible to have bread-on-demand for the whole week after one simple stir and rise session on the weekend. The best part of this method, though, is that it’s so easy Ole has started making the dough himself on the weekends, and then baking it on the grill later in the week. The method revolutionized the way we bake bread at home, and it’s made it increasingly easy to add a side of bread any time of day throughout the week. 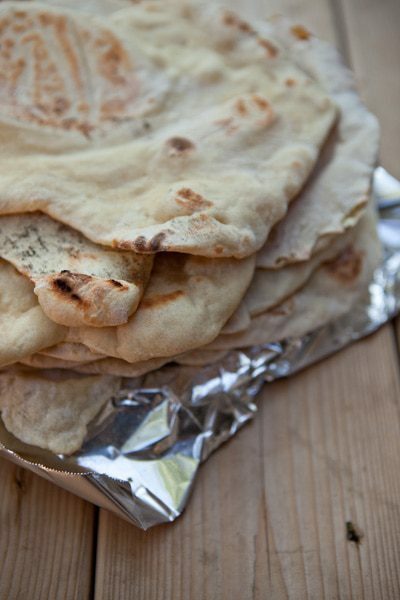 The naan here has become a family favorite, whether it’s filled with chicken and bean salad, served as snacks with hummus and tabbouleh, or the leftovers serving as the base for homemade naan pizzas. In a large 5 quart bowl or container with a not-airtight lid, mix together the water, milk, yeast, salt, yogurt, and honey. Add in the flour, about 1.3 at a time, while stirring with a large spoon or dough whisk. Cover the container loosely, leaving some way for air to escape, and allow to rest at room temperature for about 2 hours while the dough rises and collapses. Place the covered (though not airtight) dough in the refrigerator until ready to use. You can hold it for up to 7 days. When ready to eat, heat a high temperature pizza stone over the grill, turning the grill on to high. Once the grill is hot, cut off a handful of dough from the bucket (slightly smaller than a softball), roll the dough on a floured surface until thin. Place the rolled out dough one by one onto the hot stone. Cook for 2 minutes, and then flip and cook the second side for 2 minutes. 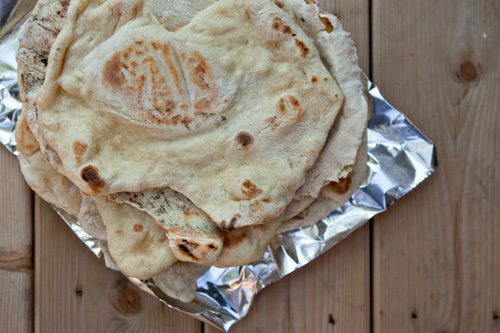 Remove naan from the grill and brush with clarified butter. Have you tried any of the “Artisan Bread in 5” books? Next PostSubscribe to Easy. Homemade.